Create your very own water slide decals with AquaPrint™! 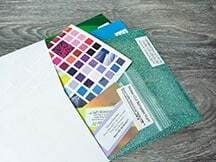 This glossy, clear transfer material uses your solvent or color laser printer to create stunning decals. Water transfer printing provides a way to decorate many kinds of materials, such as ceramic, glass and other non-porous surfaces. This is a very easy method for embellishing many types of promotional products. Available in clear or opaque. Application – Slide off one corner of decal and place on object. Side backing off while holding it in place. Gently pat water off with damp sponge. Avoid stretching. Drying- Let dry. For extra durability, bake at 350° F for 5 minutes.